Copyright Sept. 2, 2018 – All rights reserved. Thank you for your Christian integrity in advance. It will be my point in this article to once again demonstrate how all the promises of God are yes and amen – that is, fulfilled “in Christ” and center around Him and His relationship to the Church (2 Cor. 1:20). I will defend that Matthew in Matthew 1:17 and 24:34 is seeing Messiah come to recapitulate and fulfill Israel’s redemptive history described by three generational time periods marked by the prophetic period of 7 or 490 and climaxing in a second exodus generation somewhere between AD 30 – AD 70. From Abraham to David (aristocracy) = 490 years. From David to Babylonian exile (monarchy) = 490 years. From Babylonian exile to Christ (oligarchy) = 490 years. (***Note here – Matthew I do not believe is concerned with presenting a PERFECT mathematical chronology, but a numerological one based on the perfect number 7 – drawn from the 70 7’s of Daniel 9:44-27. I don’t believe a strict and perfect chronology is the point). Messiah has stepped into Israel’s redemptive history to fulfill Daniel’s 70 7’s prophecy – indeed ALL of Israel’s promises from Abraham (land, great nation, light to nations) to David (Davidic King promises – of a coming deliverer to put down all enemies), to Christ the one who has now come to be the seed of Abraham and the Divine King – to deliver from the slavery of sin and establish the New Covenant through His blood whereby He will build and transform Israel by establishing a spiritual people or Seed, with a Heavenly Land, Jerusalem, Temple, Priesthood, Sacrifices of praise within a New Creation – through faith in Him. In essence this is the same theology taken in Luke’s genealogy in Luke 3 in that Jesus is the 70th generation from Enoch. That is, Israel and the 70 nations of Genesis 10-11 can now find their hope and reconciliation in Him. Consistent with Daniel 9:24-27, Enoch prophesied a coming of the Messiah and eschatological judgment (that included the Devil and Watchers) no further than AD 70, and so Luke confirms such in Luke 21:20-32. Once Israel’s promises have been fulfilled in Him by AD 70, Christ and the Church as the New Jerusalem / Israel of God proclaim the gospel brining healing to the nations today in the New Covenant age post AD 70 (Isa. 66/Rev. 22:17). Scholars have long noticed that some genealogies are selected and arranged in an order so as to reinforce and provide theological and numerological meaning – which also serves as an aid in memorizing the genealogical data. In other words, they are not always structured to be perfect historical chronology but often have numerological or theological meaning that can be dug out of the text. “Similarly, in his genealogy of Christ, Matthew employs sabbatical theology to structure history. He purposely dropped at least four names and counted David twice to construct a sabbatical structure of the history of redemption from Abraham to the Messiah. He states that from Abraham to David is 14 generations; from David to the captivity is 14 generations; and from the captivity to Messiah, 14 generations (Matt. 1:17). This was intentional: the author purposely wanted to stress this numerical system, primarily because of its sabbatical symbolism (3×14 = 6×7); the generations of the Messiah represents the seventh seven, thereby showing that it is He who inaugurates the ultimate Sabbath rest for the people of God, the eschatological age. Matthew employs sabbatical symbolism to underscore one of his major themes: the Messiah’s advent constitutes the apex and fulfillment of redemptive history.” (Lee Irons, Meredith Kline, J. Ligon Duncan, David W. Hall, Hugh Ross, Gleason L. Archer, THE GENESIS DEBATE Three Views on the Days of Creation, (Mission Viejo, CA: Crux Press, Inc., 2001), 227). The Jews had been waiting for Messiah to come and function as their new Moses and recapitulate her second exodus and redemptive history within another generation. Some understood the “days of Messiah” to be 70 (to complete Adam’s probation 930 + 70 = 1,000) while others saw him to be a new Moses or faithful Israel bringing them out of another transitionary 40 years generation into the new creation or God’s promised heavenly land/city (ex. Heb. 3-4; 10:37–13:14YLT). 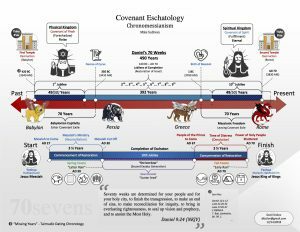 On this later view, many believed Messiah would have a transitional reign between their then Old Covenant “this age” and the “age about to come” or New Covenant age Messiah would usher in. Matthew will go on to develop this Messianic expectation as well in chapter 4 as Jesus being the faithful Moses and faithful Israel and bring the eschatological harvest at the end of their Old Covenant “this age” (Mt. 13:39-43; 24:3). But our point here is that the number 7 connected with generations and leaving the reader hanging at the number 42 — indicates that the Messiah has finally come to fulfill His redemptive work, and it would be completed within the last 7 of Daniel 9:24-27 or second exodus generation. *** 42 generations marked by the number 7. *** Jesus shows up to fulfill the last 7 (prophetic period and consummation of Daniel 9:24-27) and the second exodus generation to establish and mature the New Covenant (Isa. 9-11) — 42 + 7 (AD 30 – AD 70) = 49 (Jesus as High Priest in His first and second appearing(s) from the heavenly temple – accomplishing atonement and sabbath rest). The point is not that Messiah is going to usher in 7 more generations, but that Messiah marked by the #7 (perfection and new creation) is going to complete or bring Israel to #49 and fulfill Daniel’s seventy sevens. The number 7 is attributed to Jesus in the gospel of John and the book of Revelation to describe that Jesus is the New Creation and all those who put their faith in Him also become God’s New Creation. While revising my article on Daniel 9:24-27 and meditating upon what Kline had written on Matthew 1:17, I began trying to look at the passage from different angles. I wondered since Matthew is drawing upon the seventy sevens (490) prophecy in his genealogy, if there was a different way of coming to the # 49 or 490 other than just 42 + 7 = 49. I took 14 x 40 (a generation) and came up with 560. But before scratching this approach and going to bed I thought I would do a google search on “Daniel 9:24-27 Seventy Sevens 490 and Matthew 1:17.” The search result led me to a scholarly article written in the 1920’s by George F. Moore. He was following the same approach I was but used a 35 years generation period and not 40. Thus, by calculating 14 x 35 = 490 he reached the result I desired and suspected may be behind the text. But I still wouldn’t consider this a strict literal chronology of 490 years – even in this form. The 14 generations are still arranged with numerology or in my mind still falls within a “prophetic period of time marked by the number seven” as is the original referent (Dan. 9:24-27). “It would be much more natural for them [the Jews] to divide seventy years of normal human life by two, giving thirty-five years, which is close enough to the average as far as common observation goes, and keeps the generation in its proper genealogical relation. An example in which a generation thirty-five years is Job 42, 16, where it is said that after his rehabilitation, “Job lived a hundred and forty years, and his son’s sons, four generations.” If Matthew meant generations to fill four hundred and ninety years, he was reckoning in the same way. It is, therefore, not an objection that it requires us to assume a generation of thirty-five years.” (George F. Moore, Fourteen Generations: 490 Years: An Explanation of the Genealogy of Jesus Author(s):, The Harvard Theological Review, Vol. 14, No. 1 (Jan., 1921), pp. 97-103 Published by: Cambridge University Press on behalf of the Harvard Divinity School, bold emphasis added), pp. 101-102). The question why the generations are divided into three periods was raised by Chrysostom in a sermon on Matt. 1, 17 (In Matt. Homrn. iv). The Jews, he says, had in these periods successively three different forms of government, aristocracy, monarchy, and oligarchy, and were as bad under the last as the first; the captivity itself had failed to work amendment. It was everyway necessary that Christ should come.2 Spanheim ingeniously recalls the parable in Luke 20, 9-18: after the failure of three missions, God at last sent his son. Much more to the point than this insinuation of the incorrigibility of the Jews is an explanation which Spanheim adopts from Jansen: It was to indicate that at the time of Jesus’ birth, fourteen generations after the beginning of the exile, a great change, a new order of things, was imminent, such as had happened at the end of each preceding period of fourteen generations – the establishment of the kingdom fourteen generations after Abraham; its fall fourteen generations after David. This next great change, according to common Jewish expectations, was the coming of the Messiah; and precisely at this critical moment in history was born, as the title of our genealogy emphasizes, “Jesus Christ (the Messiah), the son of David, the son of Abraham” (Matt. 1, 1). To this verse 17 returns: “From the deportation to Babylon to the Messiah, fourteen generations.” That this was the intention of the author seem clear.” (Ibid.). “It was the general belief of the Jews that in his plan for the history of his people and of the world God had determined not only the events in their succession, but the times at which they should come to pass; and especially that the great epochs in history, such as the end of their long subjection to the heathen powers and the coming of the promised golden age, were unalterably fixed. They believed also that God had revealed through the prophets certain signs which foreboded the approaching crisis; they made catalogues, so to speak, of these signs, and scanned the horizon of the times for their appearance. From the second century before our era, at least, they combined with such prognostications an attempt to ascertain the date more exactly by numerical calculations based on scripture, as in Daniel and Enoch, and thereafter in apocalypses almost universally. Both Daniel and Enoch take the beginning of the exile as the terminus a quo for their reckoning, and count from that point four hundred and ninety years to the end of the period in which they were living, an end which they believed to be imminent.” (Ibid., p. 100). 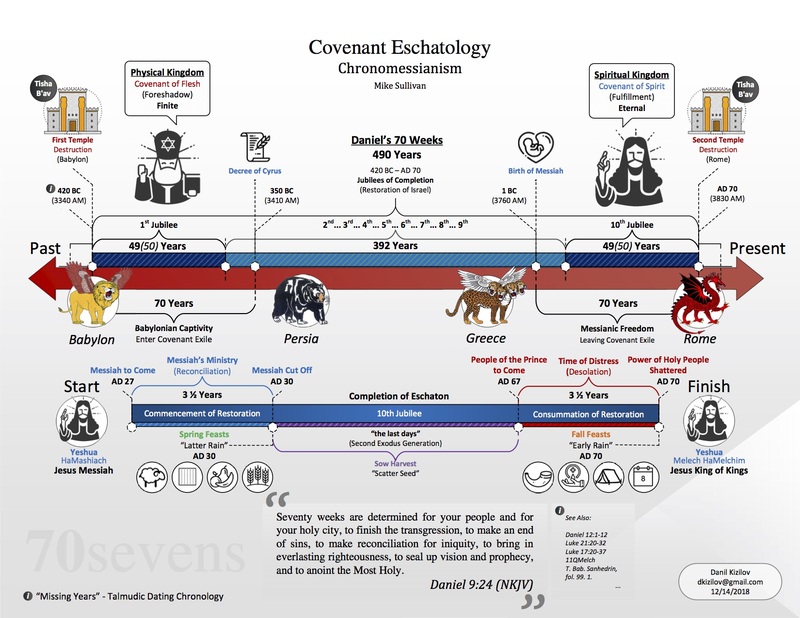 So, there are 70 7’s (490) in Daniel’s prophecy that influences Matthew’s genealogy and imminent eschatology bringing us to Jesus and the terminal generation (Mt. 24:15-34), and Luke incorporates and also draws upon Enoch’s eschatology of 77 generations (with Jesus being the 77th or the 70th from Enoch), that will form his development of the terminal and imminent eschatological generation (Lk. 21:20-32). Jude affirms Enoch’s eschatological genealogy and connects it with Jesus’ Second Coming (cf. Jude 14-15, 21, 24; 1 Enoch 1:9; 60:8). It is within this first century contemporary generation that God was preserving and protecting the Church from the Jewish apostasy in going back to the law and would “present” Her blameless to Christ as His bride while at the same time judging her Jewish persecutors with wrath along with the Devil and the Watchers (cf. Mt. 24-25; 1 Thess. 2:14-16; 2 Thess. 1:4-10). A friend of mine Jeffrey T. McCormack has lectured on and written of Enoch’s influence upon the NT. My point in quoting him below is to give you the context of his discussion as it leads down to Enoch’s eschatology pointing to AD 70 and therefore some of the struggles the Church has had with the book of Enoch. “Well, for the larger part of church history, the Book of Enoch was lost to the church. The early church period after the Apostle had it, with even some sects of the church, like the Ethiopic branch, holding it as indeed sacred and part of their canon. It was considered as scripture in the Epistle of Barnabas and by many of the early Church Fathers, such as Athenagoras, Justin Martyr, Clement of Alexandria, Origen, Irenaeus and Tertullian, who called the Book of Enoch “Holy Scripture,” and wrote c. 200 that the Book of Enoch had been rejected by the Jews because it contained prophecies pertaining to Christ. His implication here seems to be saying that some in the early days of the church believed the second coming was in AD 70. Sadly, he does not develop that or explain any further as to where he is pulling this tidbit of information from. In Enoch, it predicts the Messiah will arise 70 generations after Enoch, ‘seventh from Adam.’ This in itself would be harmless if Enoch was just a fairytale, but in Luke’s genealogy of Jesus there are indeed 70 from Enoch to Jesus! It seems that (a) Enoch correctly predicted it, (b) Luke modified the genealogy here and there to make it match Enoch, (c) Enoch is again taking from it (Luke). Something is going on here! If Luke just made something up like that, how can we be sure he didn’t just make up or borrow things from older non-inspired texts as he saw fit? “The reference to the spirits being imprisoned is decisive. Any literate Second Temple Jewish reader of 1 Peter 3:19 would have understood that Peter was referring to fallen nonhuman spirits, the Watchers who sinned before the flood (Gen. 6:2).” (Dr. Michael S. Heiser, REVERSING HERMON ENOCH, THE WATCHERS & THE FORGOTTEN MISSION OF JESUS CHRIST, p. 140). “…2 Peter and Jude communicate something about the flood and the sons of God that wasn’t found in Genesis, but which came from the Second Temple book of 1 Enoch. Specifically, 1 Enoch 6—15 describes how the sons of God (called “Watchers” in that ancient book) who committed the offense of Genesis 6:1-4 were imprisoned under the earth for what they had done. The offending Watchers are the “spirits in prison” in 1 Peter 3:19). Recall that the prison to which the fallen sons of God were sent was referred to as Tartarus in 2 Peter 2:4-5. The imprisonment explicitly described here doesn’t come from Genesis 6:1-4, but from 1 Enoch. It is clear evidence that Peter’s description was influenced by the Enochian story of the transgression of the Watchers.” (Ibid., p. 142-143). 1). The OT prophets longed to know how and when the Messiah’s salvation would be fulfilled – something the disciples were being shown (Mt. 13:16-43). 1). The OT prophets longed to know how and when their predictions of the Messianic kingdom and salvation would be fulfilled (1 Pet. 1:10-11). 2). HOW– the salvation and kingdom was not to be physically seen but realized “within” the soul or spirit (Lk. 17:20-37). 2). HOW– The inheritance of the kingdom promises was to be realized within or a “salvation of the soul” (1 Pet. 1:9). 3). WHEN– The Second Coming of Jesus, His coming Kingdom and salvation would arrive within some of their lifetimes and within their generation (Mt. 10:8-9, 17-23; 16:27-28; 24:1-34; Lk. 21:27-32). 3). WHEN– The Second Coming of Jesus, His coming Kingdom and salvation was “ready to be revealed” to Peter’s contemporary audience and generation (1 Pet. 4-12; 4:5-7; Acts 2:20-40). 4). OT prophets predicted soteriological and eschatological events that would “all” be fulfilled in Jesus’ contemporary generation (Lk. 21:20-22). 4). OT prophets predicted soteriological and eschatological events not for their day and time but for Peter and the first century Church to see fulfilled (1 Pet. 1:4-12; 4:5-7, 17). Peter tells the church that “salvation” was “ready” or “at hand” to be revealed for these first-century Christians and again points this out in 4:5-7. The phrase “in the last time” singularis a more imminent time statement than the “last times” plural in (v. 20). The first is communicating the idea of Christ’s Second Coming arriving on the last day, which would be found withinthe last days or “last times” period. The “last times,” is synonymous with Peter’s “last days” of Acts 2 and encompasses Jesus’ First and Second Comings through which He would accomplish salvation for His Church. “If he is expecting his readers to bring the content of Isa. 40 along with the actual lines quoted, then the word preached to them is doubles the word promising the visitation by Yahweh…- manifested in the gospel itself… fulfilled at the end of the age.” (Ibid., 1022). We will see at the beginning of chapter 2, Peter uses Psalm 34 in a similar way he has used Isaiah 40. And once in chapter 2, we will also take note of the imminent coming salvation and judgment that will be referenced in Isaiah 28; Ps. 118 and Isaiah 8. The timing of the kingdom or when and how the stone cut without hands would be fulfilled. The coming of one like a Son of Man that came upon the clouds “as the Ancient of Days” (OG) LXX and the inheritance or entrance of the saints into the kingdom. The persecutions leading up to the inheritance of the kingdom. The desolation of Jerusalem and the Temple connected to the forgiveness of sin. The “time of the end” (not the end of time) and judgment and resurrection of the dead. In Daniel 12 he is told to seal up the vision because the time of fulfillment for these things would be “far off” and he would not live to witness them. This and that all of these events were connected with the destruction and judgment upon Jerusalem and the Temple (Dan. 9:27; 12:7, 13). Therefore, of all the OT prophets, Daniel is probably the most diligent in seeking clarification and given the clearest revelation concerning the time and way Messiah and His Kingdom would arrive and be fulfilled. He is also given the clearest revelation that he would not live to see the fulfillment of these events and that his prophecy would involve something “far off” (some 600 years). The inheritance of the kingdom and the Son of Man coming upon the clouds would be during the time of the fourth or Roman Empire. And that when Messiah came, the NATURE of His Kingdom would be different than the previous physical, earthly, theocratic and military kingdoms of the world. Thus, it would even be different than Israel’s earthly Old Covenant kingdom. Thus, when Jesus came during the time of the Roman Empire identifying Himself as the “Son of Man” who would come upon the clouds of heaven with the Messianic Kingdom in the first century generation, they should have known He was the fulfillment of Daniel’s prophecies. This and when Jesus described the spiritual nature of His kingdom to be realized “within” at His Parousia and was “not of this world,” (“cut without hands”) this too should have been clues (Lk. 17:20-37; Lk. 21:27-32; John 18:36). But it was predicted by Moses that when Israel’s “last days” “perverse and crooked generation” arrived her “end” would be “near” but the vast majority would not be able to “discern” it. Even Isaiah and Jeremiah predicted that the New Covenant Messianic Kingdom would be a “new thing” and “strange work” in their midst (Isa. 42:9; Isa. 43:18-21; Jer. 31:22; Isa. 28:21). It was “new” or “unfamiliar” because it would be spiritual in nature, and a “strange work” because in establishing it, He would judge the vast majority through the Roman armies — not delivering and establishing an earthly kingdom from the Roman Empire. Only the remnant would be able to look back at the destruction of Jerusalem in AD 70 and know that the coming of the Son of Man and the arrival of His Kingdom had “already come” (Mrk. 8:38—9:1). 1). Isaiah 24– In Isaiah 24, the “shaking” and de-creation is the result of Old Covenant Israel breaking the Mosaic Law. This doesn’t fit the modern eschatological paradigm. the covenant curses of Deuteronomy 28 and Leviticus 16 for rejecting Him as the fulfillment of the Law and Prophets. Therefore, that OC heavens and earth would pass away, but His words of the NC heavens and earth would never pass away or be forgotten. Thus, the OC has to still be binding and imposed in order for the de-creation of Matthew 24 to be fulfilled. Since the OC was still “passing away” and was “soon to vanish” in AD 70, this was the only time the de-creation of Matthew 24 was to be fulfilled and was within that contemporary generation. Jesus has also informed us that Isaiah’s “last days” “in that day” judgment whereby Messiah will establish His rule in Jerusalem would fulfilled in AD 70 (Lk. 23:30/Isa. 2:10-19/Isa. 24:19-23). And since Isaiah 24 recapitulates Isaiah 2’s “in that day,” judgment and salvation — both chapters were fulfilled at Christ’s “in that day” Second Coming in majesty and splendor upon OC Jerusalem in AD 70. The de-creation and new creation of 2 Peter 3 and Isaiah 65 involves the presence of the OC curses as well (cf. Isa. 65:13-15). So, in order for the de-creation of Isaiah 24, Matthew 24 and 2 Peter 3 to be fulfilled, it has to be the result of Israel breaking her OC law and those curses coming upon her. Only between AD 30 – AD 70 was the OC Law of Moses still imposed and her curses upon Israel relevant. Thus, unless one wants to argue the Mosaic OC Law is still present and binding today for National Israel and the Church, these passages cannot be fulfilled post AD 70. 2). Isaiah 25– When OC Jerusalem is judged and becomes a “heap of rubble” the Messianic banquet and resurrection will be fulfilled (vss. 2, 6-9). Again, Israel’s “last days” “in that day” coming of God in the judgment of Isaiah 2 and 24 is recapitulated here in chapter 25. He predicted in Matthew 8:10-12; Matthew 22:1-14 and Matthew 24:1—25:1-13 that when He came upon the clouds to judge Jerusalem in His contemporary generation (by which “not one stone would be upon another” / “heap of rubble”), this would be the time He would send the Roman armies to burn Jerusalem and thus fulfill the wedding banquet and resurrection promises of Isaiah 25:6-9 for the New Covenant Kingdom people of God. While Peter does not specifically reference Isaiah 25 and or develop the eschatological marriage motif as much as Jesus and Paul does, when Peter is addressing the arrival of the New Creation of Isaiah 65-66 in 2 Peter 3 or the imminent judgment of the dead in 1 Peter 4:5-7 — we are to understand the arrival of the New Creation is the time of the judgment and resurrection of the dead and thus the fulfillment of the wedding banquet as well with all of these linked together for us by John in Revelation 19-22 at the “soon” Second Coming of Jesus in AD 70. 3). Isaiah 26– Describes the eschatological birth pains just be before the Second Coming and resurrection is fulfilled. This would also be the time when Israel’s sin of blood guilt would be judged, and thus the martyrs vindicated. The judgment of the living and dead as being the time for vindicating the blood of the martyrs (as far back as Genesis and Abel) to be fulfilled. The eschatological birth pains of all the OT prophets to be fulfilled. The resurrection and or gathering of the elect at the end of the OC age to be fulfilled. ALL of these promises that can be found in the OT prophets to be fulfilled within His contemporary “this generation” thus linking Matthew 23 to chapters 24-25 (see also, Lk. 21:22 – which would include the birth pains and resurrection of Isa. 26). They were currently in the tribulation (1 Pet. 1:6-7 or period of eschatological birth pains) and therefore being tested just prior to Jesus’ imminent Second Coming — per Jesus’ teaching in Matthew 24. While OC unbelieving Israel could not give birth to a “people” or nation that included the Gentiles, Peter sees faith in Christ coming from the believing remnant Jews and the Gentiles forming the birth of the Israel of God or “nation” and “people” (1 Pet. 2:9). Since “THE judgment” of the living and dead was “near” (1 Pet. 4:5-7, 17) the judgment and resurrection of the dead as described in Isaiah 25-27 was thus near. 4). Isaiah 27– Describes the coming “in that day” judgment in which the following occurs: 1. “Leviathan the gliding serpent” is slain and judged, 2. the blossoming of Israel filling the world with fruit and the forgiveness of sin occurs, 3. the spiritual, corporate and covenantal killing and striking down of OC Israel – when he makes “Jerusalem desolate” and “all the altar stones to be like chalk stones crushed to pieces” is fulfilled, and lastly – 4. The eschatological trumpet and or resurrection gathering is accomplished. Jerusalem and the Temple would be made desolate and thus not one stone of the Temple would be left upon another. OC fleshly Israel would be struck dead and she would be a corporate, covenantal and dead “carcass” for Rome to pick apart. Salvation and redemption would be achieved at this time. The trumpet gathering or resurrection. This would be when the judgment of the devil and angels occurred. Satan, the demons and the Watchers reserved in darkness and chains are finally judged. While Jesus describes OC Israel as a dead carcass never to rise again, and the passing of the “heavens and earth” to occur in His generation, I think it is proper to assume that a resurrection/glorification/restoration of a New Covenant Israel/Jerusalem along with a New Heavens and Earth emerges at this same time (as described by both Peter and John). This would be when the soteriological and eschatological “inheritance” of the “kingdom” and “salvation of the soul” was “ready” to be fulfilled. 5). Isaiah 28– Because Israel would not listen to their own prophets speaking their own language, she would perform and undergo the following: 1. be judged by a nation speaking a foreign language, 2. these Jewish “scoffers” mocked the prophets concerning their impending judgment, and 3. since the prediction was considered nonsense to these scoffers, they would be “injured” “snared” in a trap and thus “captured” and led away as slaves, 4. A precious corner stone is laid in Zion as a standard for just judgment, 5. God would come as He had at Mount Perazim and Gibdon, 6. This would be a “strange work,” 7. This judgment had be “decreed” and unalterable and lastly, 8. All of this would be the result of God’s wonderful counsel and wisdom. The Roman army was composed of all the nations of the world at that time when they “surrounded Jerusalem.” Therefore, it is possible the Jews heard foreign languages as they had when the Babylonians and Assyrians attacked them in the past. Jesus laid a “snare” or “trap” for the Jews by causing His Second Coming to take place during the feasts of Israel. Thus, Jews who were persecuting Christians throughout the Roman Empire were gathered in Jerusalem to be slaughtered. God gave them over to listen to the false prophets who predicted God was going to overthrow Rome and establish an earthly kingdom for fleshly Israel. The Jewish “scoffers” of Isaiah 28 that were claiming Peter and the Apostles were making up myths concerning a “near” “this generation” coming of Christ in judgment (as Jesus apparently had as well) and that it simply was not going to happen. They mocked the promise as being “slow” as that generation was coming to a close. The fulfillment of Isaiah 28:16 here in 1 Peter 2:6 and the salvation and judgment context of Isaiah 28 cannot be ignored.” (Mike Sullivan,Peter and the Restoration of All Things – Part 2, https://www.facebook.com/mike.sullivan.562/notes?lst=611759191%3A611759191%3A1535908601). So clearly, there is a lot in between 1 Peter 1-2 that Dr. Michael Heiser is not addressing when it comes to the “near” Second Coming of Jesus to judge those Watchers reserved for the coming judgment in AD 70 – an event that took place in the Unseen Realm. As this article has demonstrated – both Daniel and Enoch’s 490 symmetry and structure of the end time eschaton do not go beyond AD 70. Therefore, not only do both Matthew and Luke draw upon their structures and symmetry in their genealogies, they (and Peter’s eschatology) teach under inspiration, that Christ’s Second Coming to close the Old Covenant age in AD 70 was truly imminent and go no further (Mt. 24:3-34; Lk. 21:20-32; 1 Pet. 1; 4:5-7, 17)! In closing, it is interesting that from Christ’s birth to His Parousia in AD 70 is roughly a 70 years period of time and Jesus’ crucifixion is estimated to have taken place between AD 30 – AD 36. David reigned over Israel for 40 years but lived to be 70 years old – having put down all of Israel’s enemies. Isaiah 23:15 states that the life of a king is 70 years following the average lifespan according to Moses in Psalm 90. Jesus was born the king of Israel and was “cut off” in the midst of his 70 years. He was born into the fleshly Old Covenant world and yet, was the “first” (first fruit or firstborn) to rise in the spirit or into the spiritual New Covenant world of righteousness – blazing the trail for the Church as our Great High Priest to follow “in a very little while” (Heb. 926-28—10:37). Christ continued to reign from the righthand of the Father putting down His enemies (that refused to have Him rule over them) in AD 70 (Heb. 10:13-37). Christ continues to reign through the Church in the NC age today through the preaching of the everlasting gospel (Isa. 65-66 / Rev. 22:17). This entry was posted in Articles and tagged 70 ad by admin1. Bookmark the permalink.